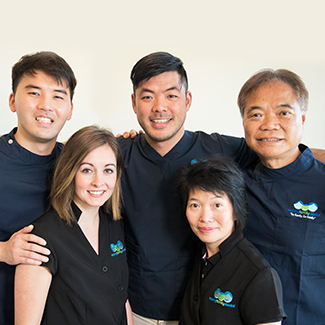 For over a decade, our Epping Family Dental team has provided no gap checkups and cleanings for families just like yours. Epping Family Dental combines affordable dental care and a welcoming atmosphere with the latest in state-of-the-art therapies like full mouth reconstruction with dental implants. We understand what it takes to raise a happy, healthy family. That’s why we’re here to assist you in achieving the best oral and overall health possible. Call us at (02) 9868 6288 or book your first appointment online today. We look forward to meeting you! We are a family-friendly, family-run dental practice. We’re passionate about making the best oral healthcare accessible to families just like yours, in the most cost-effective manner possible. At our modern practice, you’ll see that your experience is hassle-free, quick and easy for everyone involved. We do our utmost to ensure that your family trip to our office is comfortable and efficient. Contact us at (02) 9868 6288 or book your appointment online today! We accept all health fund providers, offer no-gap check-ups, X-rays & cleans, and have an on-site HICAPS machine so you can claim on the day. Please feel free to discuss any financing concerns with our front desk, as we also offer flexible payment plans.